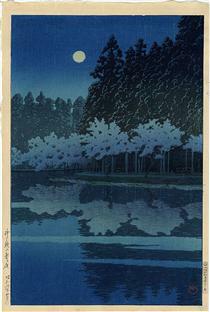 Hasui Kawase (川瀬 巴水, Kawase Hasui, May 18, 1883 – November 7, 1957) was a Japanese artist. 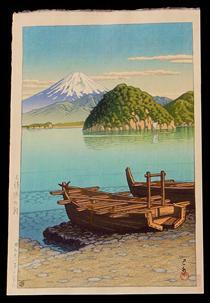 He was one of the most prominent print designers of the shin-hanga ("new prints") movement. From youth Hasui dreamed of an art career, but his parents had him take on the family rope and thread wholesaling business. Its bankruptcy when he was 26 freed him to pursue art. He approached Kiyokata Kaburagi to teach him, but Kaburagi instead encouraged him to study Western-style painting, which he did with Okada Saburōsuke for two years. Two years later he again applied as a student to Kaburagi, who this time accepted him. 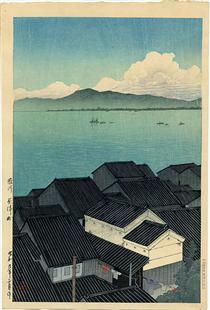 After seeing an exhibition of Shinsui Itō's Eight Views of Lake Biwa Hasui approached Shinsui's publisher Shōzaburō Watanabe, who had Hasui make three experimental prints that Watanabe published in August 1918. 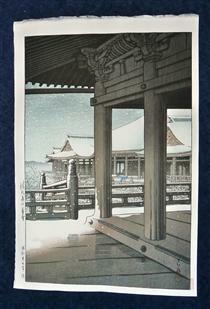 The series Twelve Views of Tokyo, Eight Views of the Southeast, and the first Souvenirs of Travel of 16 prints followed in 1919, each issued two prints at a time. 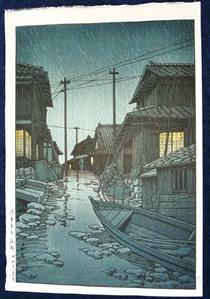 Hasui's twelve-print A Collection of Scenes of Japan begun in 1922 went unfinished when the 1923 Great Kantō earthquake destroyed Watanabe's workshop, including the finished woodblocks for the yet-undistributed prints and Hasui's sketchbooks. 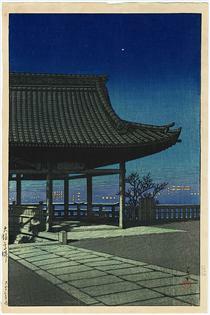 Hasui travelled the Hokuriku, San'in, and San'yō regions later in 1923 and upon his return in February 1924 developed his sketches into his third Souvenirs of Travel series. 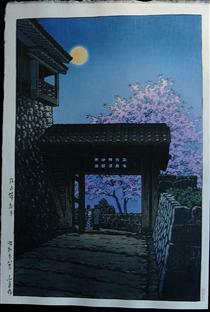 Kawase studied ukiyo-e and Japanese style painting at the studio of Kiyokata Kaburagi. He mainly concentrated on making watercolors of actors, everyday life and landscapes, many of them published as illustrations in books and magazines in the last few years of the Meiji period and early Taishō period. 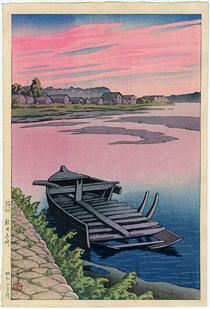 During the forty years of his artistic career, Hasui worked closely with Shōzaburō Watanabe, publisher and advocate of the shin-hanga movement. His works became widely known in the West through American connoisseur Robert O. Muller (1911–2003). In 1956, he was named a Living National Treasure in Japan. 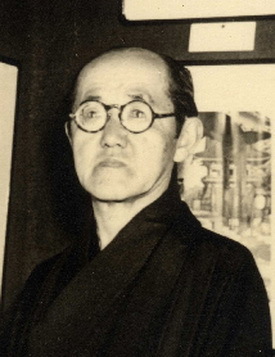 Hasui's younger brother Kasuke moved to London in 1916 to work as an accountant for Okura and Co, he married an English woman, Clara Greenfield, they have one surviving daughter Kathleen and grand daughter Karen Kawase. His maternal uncle was Kanagaki Robun (仮名垣 魯文) with the pen name of Nozaki Bunzō (野崎 文蔵) (1829–1894), a Japanese author and journalist, producing the first manga magazine. 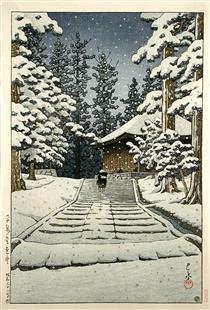 Hasui considered himself a realist and employed his training in Western painting in his compositions. 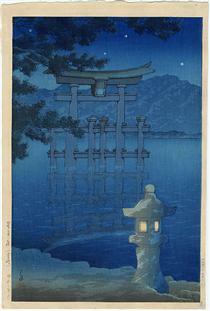 Like Hiroshige he made travel and landscape prints, though his subjects were less known locations rendered with naturalistic light, shade, and texture, without the captions and titles that were standard in prints of Hiroshige's age. 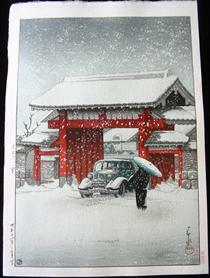 Kawase left a large body of woodblock prints and watercolors. 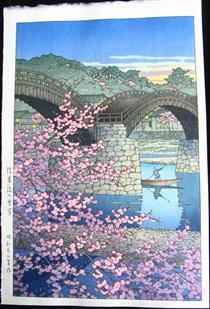 Many of the watercolors are linked to the woodblock prints, he also produced oil paintings, traditional hanging scrolls and a few byōbu (folding screens).